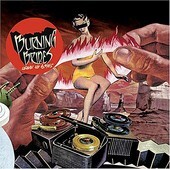 Burning Brides come barreling back from the garage with a 12-track offering that details the trio's rock 'n' roll wares in fine form. From the AC/DC-esque feel of the opener "Heart Full of Black" until the cowboy rock swagger of "Vampire Waltz" (with choral help from everyone's favorite haunting vocalist Mark Lanegan), a dirty groove not unlike bands like Queens of the Stone Age is laid down, purveying the entire length of Leave No Ashes. Meshing the grungy goodness of Nirvana on the belligerent "King of the Demimonde", the remnants of dangerous rock on "Alternative Teenage" and the rhythmic romp of the title cut, Burning Brides walk the line between indie rock and good old hard nosed rock 'n' roll with a whiskey bottle in one hand and a bottle of pills in their pockets, ready for a rock adventure of epic proportions. Hope you're ready, too.